Planning a teen party can be daunting, seeing as though they aren’t into princess or super hero parties anymore. As they begin to transition into adolescence, they tend to like more grown up birthday party themes. Look no further as we make it easy, with a range of teenager birthday party themes to choose from. Go to your local hardware shop or variety store and buy some black light bulbs to place at your party venue, as well as purchasing plenty of highlighter pens in different colors. Tell all your guests to wear some cheap white t-shirts to the party. The UV from the black light will create a purple glowing effect. When your guests arrive, hand them all a high lighter pen and get them to start writing and drawing on each others t-shirts. 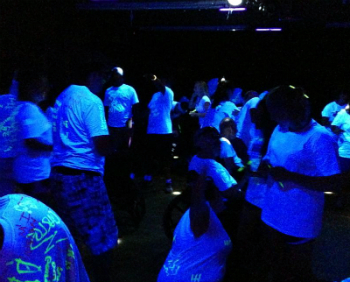 As they walk into the room, the ink from highlighters will be emphasised, creating glowing effect. Has to be one of the best teenager birthday party themes to get them into the spirit and making the party a night to remember. The main aspect of the party is to ensure that the color them is white with the famous Tiffany blue. A good party shop should have this color in stock. The tables and chairs should be covered in the two colors (Such as table cloth, table runners, seat covers, etc). A table to display the Tiffany cake and sweets should the centrepiece of the party with color matching boxes to resemble the packaging which Tiffany and co use. Macaroons and chocolate sweets incorporating the Tiffany blue should also be considered to match with the party theme. Condition of entry is that all guests must dress as a famous singer and stay in character. Singers could include Michael Jackson, Elvis Presley and so on. Run a red carpet down the hallway into the main room which has a disco ball and old CD’s hanging from the ceiling. A karaoke machine and disco lights can also be to add to the atmosphere and get everyone into the spirit of the theme. A cake shaped as an electric guitar can be the centrepiece of the party. Be sure to note on the invitations that an award will be presented for the best dress hip hop outfit (Examples such as 2Pac, Biggie, MC Hammer, etc). Towards the end of the night, the top 3 guests will be voted by the public where prizes will be handed out such as novelty bling, $10 Itunes gift card, etc. Get an old large black cloth or tarp and graffiti with spray paint with a birthday message. Once dry then place on a wall as the main piece. For music ideas, look at the R&B/Hip-hop music play list. A pastel pink and white theme. Print and cut out the main character of hello kitty and place around the room. Use fishing wire from one side of the room to the other, hanging pink and white lanterns. Scatter pink sequence with party confetti and small lollies over the tables. Use a few of the hello kitty plush dolls as centrepieces along with the dessert table.